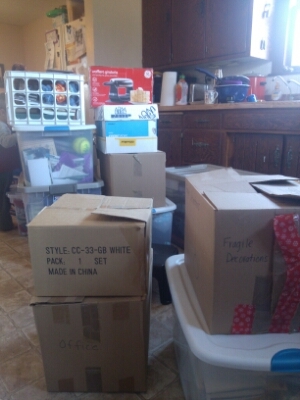 Purchasing a house is so stressful but nobody mentioned that moving is so much worse! My sleep deprived self (Tag Along is getting his two year molars) forgot that my biggest challenge when packing and sorting things for moving would be Tractor Man and Tag Along. After all my junk could very well be their treasure! The problem is we do not want to keep all of their ‘treasure’-Tractor Man finds rocks to be very interesting and any old rock will do. 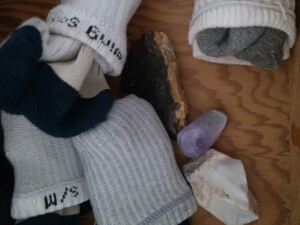 Socks and rocks-that would make sense right?!?! Maybe if he is rhyming but until he can make rock socks I do not feel the need to keep them in the sock drawer. While this can be very funny to many, I still feel the added weight of carrying regular driveway rocks to be a bit more than I planned for. To add to our box predicament Tag Along turned two and his present somehow got mixed in with the next set to move from the old house to the new house. After searching the basement for a bit it was recovered luckily. It seems that no matter where you are or where you are going there will always be a bunch of boxes that follow you. My advice, try not to let the kids take it out once it is packed. homesteading, kids helping move, moving, packing boxes, packing kids.